I think most of the readers at MusTech.Net know that I’m an avid SmartMusic and Finale fan. I have performed many clinics and training sessions focused on the software (some on behalf of MakeMusic). I’ve also written about the various MakeMusic products (I have a number of related MakeMusic-resource posts on MusTech.Net including here and here) and use them in my college courses with my students at Grove City. It looks as though SmartMusic is having a “back to school” (un-announced on their main website pages yet?) 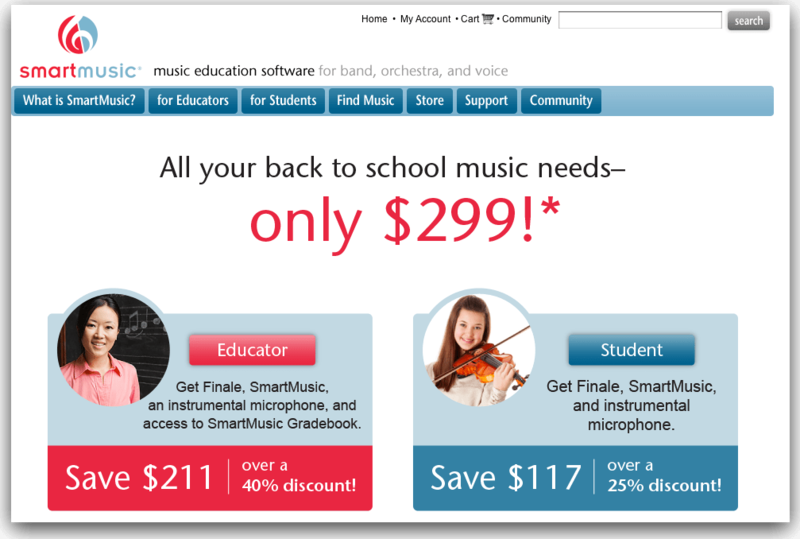 special for Educators and Students with savings through a bundled deal that contains SmartMusic (with access to the SmartMusic Gradebook for Educators), Finale (Full-Academic Version), and a Free USB instrumental mic. The total, “bundled”, sale price for students or teachers is listed at $299.00. This is a savings of over 40% for teachers and 25% for students! Please spread the word to all of you teacher and music students friends (try some of the social media links around this post)!